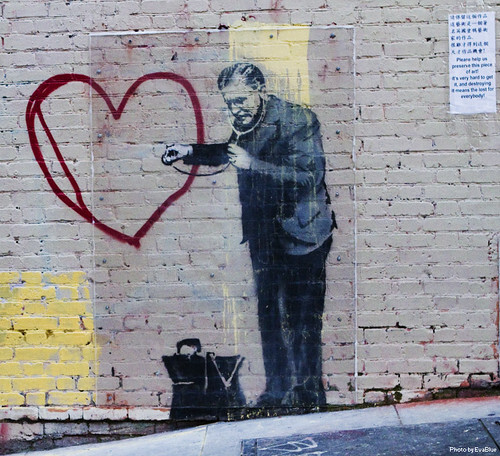 Banksy "Peaceful Hearts" Doctor, San Francisco, 2010. CC Image courtesy of Eva Blue on Flickr. Did you ever watch the tv show Felicity? It was a favorite of mine back in the day (you know, ten-ish years ago). The show followed the trajectory of a group of college students in Manhattan--their identity crises, love lives, and existential worries that many experience as undergraduates. For some time the title character struggled with choosing between going pre-med or studying art. (I believe she chose medicine in the end, to my disappointment). Well, according to this article by Dr. Gary Christenson, president of the Society for the Arts in Healthcare, Felicity could have done both--and been a better doctor for it. Read on to find out how a drawing class can help doctors become better at their jobs. In the article, Dr. Christenson outlines many ways in which the arts can improve healthcare, from improved patient experience through design to the art therapy for patients Alzheimer's disease. But the point I found most surprising was that medical students with visual arts training demonstrated improved observational skills. In a 2001 study, med students who participated in forms of visual arts training, such as life drawing and art observation exercises, showed stronger visual diagnostic skills than those with no arts training. This actually makes perfect sense. I'm not an artist by any stretch of the imagination but I did take Drawing I as an undergraduate as part of my art history requirements. To draw something accurately (or even inaccurately, if you're going the abstract route) observation skills are paramount--otherwise your drawing will not look how you want it too (abstract or not). Over the course of my Drawing class I noticed that even my casual observation skills improved. I would notice small details--the way light filtered through a glass of water or the unique contours of an outdoor sculpture--far more acutely than I ever did before. So it only makes sense that life drawing would have practical applications for doctors as well. And the best doctors must have keen observation skills in order to make an accurate diagnosis. This is a real, hard skills example of how visual arts education has an impact on a field that is impossible to trivialize--and whose reform has been at the forefront of our collective consciousness for at least a couple of years now. (Indeed, Dr. Christenson also shows ways that art can help hospitals cut costs--a big part of the healthcare debate.) The article also provides many examples of real world arts integration, which I blogged about last week. The piece is certainly worth a read if you're interested in finding a unique new arts advocacy angle, health care reform, or both! Dr. Christenson concludes by saying that "physicians should be advocates for the arts in general and, more specifically, in medical education and practice." Hear hear! What do you think? Have you seen the power of the arts in healthcare at work, from art therapy to improved design? Or do you know any artist-doctors who wind down at the easel in their off time? P.S. The public art mini-series returns next week!